For more detailed coverage, see harvardmag.com/new-corporation-members. 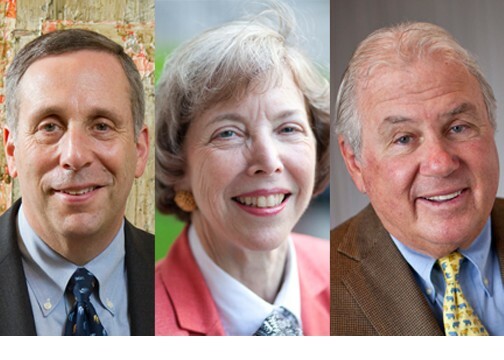 A day before Commencement, the Har­­vard Corporation elected three new members, with the consent of the Board of Overseers: Lawrence S. Bacow, M.P.P.-J.D. ’76, Ph.D. ’78; Susan L. Graham ’64; and Joseph J. O’Donnell ’67, M.B.A. ’71. When they began serving, on July 1, the trio increased the Corporation’s ranks from seven to 10, a major step in implementing its planned expansion to 13 members with a new committee structure, among the reforms announced last December (see “The Corporation’s 360-Year Tune-Up,” January-February, page 43). Bacow, who is about to retire after a decade as president of Tufts, was previously chancellor of MIT. He thus brings to the Corporation both extensive higher-education experience (complementing Fellow Nannerl Keohane, president emerita of Duke and Wellesley) and long engagement in the Greater Boston community. When William F. Lee ’72 was elected a Fellow last year, he became the first current member other than President Drew Faust to live locally—an advantage in keeping current with the campus. Now, with Bacow and O’Donnell on the board, there will be three Bostonians, plus Faust. Graham, Chen Distinguished Professor emerita of electrical engineering and computer science at Berkeley, was an Overseer from 2001 to 2007 and chaired that board in 2006-2007, serving on the search committee that chose Faust as president. Complementing this knowledge of Harvard governance is her service as the first chair of the Radcliffe Institute’s visiting committee; she also helped effect the transition from division to school of Engineering and Applied Sciences—her area of expertise, and a field where Harvard plans significant growth. O’Donnell is a Boston business executive, past Overseer, current member of the Allston Work Team (which is formulating new plans for campus development, and through which O’Donnell has worked closely with several current deans), and a leading force in Harvard and other philanthropic activities. His fundraising experience—useful as Harvard launches a new capital campaign, and an avowed area of new interest for the Corporation—includes service as a member of the executive committee of the $2.6-billion fund drive that concluded in 1999. He is also a recent College parent, of Kate ’09 and her sister, Casey ’11 (see "Commencement Confetti").